How to Defeat Gyoubu Masataka Oniwa (Boss Guide). How to Defeat Lady Butterfly (Boss Guide). How to Defeat Genichiro Ashina (Boss Guide). How to Defeat Folding Screen Monkeys (Boss Guide). How to Defeat Great Serpent (Boss Guide). How to Defeat Guardian Ape (Boss Guide). 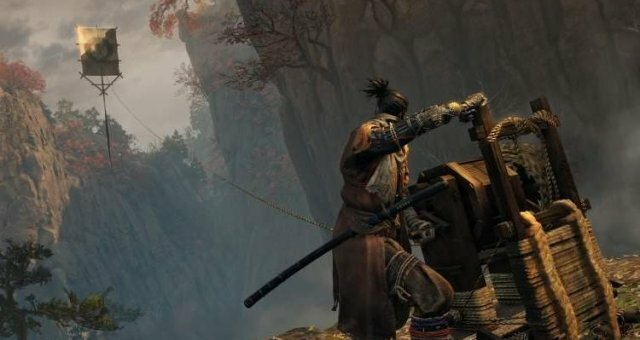 How to Defeat Great Shinobi - Owl (Boss Guide). How to Defeat Corrupted Monk (Boss Guide). How to Defeat Great Colored Carp (Boss Guide). Once you get to the Palace Grounds idol, you'll find a winding staircase that leads quite a fair ways upwards. Once at the top, you'll notice a small cave with the option to pray. Do that and you'll be transported to the Divine Realm where you can kill the Divine Dragon. 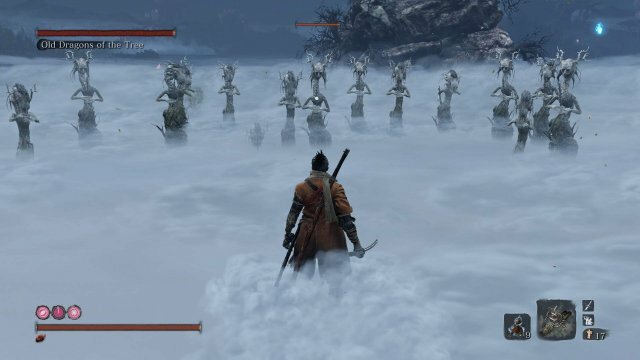 This boss fight is actually insanely easy so don't worry too much! Upon entering, you'll be greeted with these flute boys. Give them a couple of whacks to summon a tree branch out of the ground. Be careful, it'll do a bit of damage to you if you don't leap out of the way beforehand. 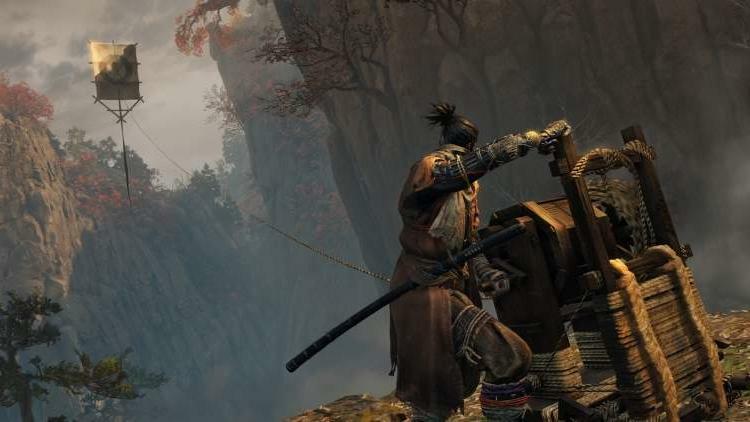 When the branch is up, you'll be able to grapple on top of it and deathblow the flute boys below. Choose the one in the middle as the area-of-effect from this ability is wide and will kill multiple. This'll just make the bar drain quicker the more you kill in one swing. After the bar is dropped, another cutscene will appear and you'll see this monstrous dragon appear! Looks pretty cool, huh? More like... looks pretty easy! Especially so because he only has two abilities in his moveset and they're dodged with running and jumping. Move One: Sends a vertical blade spinning your way three times. Just run left or right. Move Two: Sends a horizontal blade spinning your way twice. Just jump with the icon. Throughout the battle, there will be five pillars in front of you. Only one of them will be lit up with lightning. Your goal is to avoid Move One and Move Two. Then once he's resting, grapple onto the pillar with the lightning and hit your attack button. You'll do this multiple times until the pillars dissipate at a quarter health left. From here, it's just about dodging the same abilities as you have been until they come back up. After you fling the final lightning rod into the boss, you'll grapple onto him and slice his head to victory!